Hope all is good w/ you....meet w/ Linda Kipp Fendley and Wally Carpenter on the parade route Saturday of Glad Festival 2013....ya know 2016 is right around the corner and we will have been 50 years out of Momence High!!!! Can ya believe it??? Where has the time gone!!! lol!!! What do you think about a 50 year class reunion??? An idea we are giving serious thoughts too....serious enough to start gathering names & addresses...and ideas...would sure appreciate your input...and of course your address!! Is there any other Momence High 1966 grads or even fellow classmates that you are in contact w/ that you could spread the word...pass on address & contact information for that would be appreciated also... Have a feeling the next 3 years are going to be busy!!! lol!!!! More 1966 alumni from Momence HS have posted profiles on Classmates.com®. Click here to register for free at Classmates.com® and view other 1966 alumni. 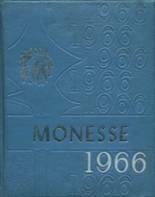 The students that went to school at the Momence high school called Momence High School and graduated in '66 are on this page. Register to add your name to the class of 1966 graduates list.